Les Deux Fontaines is a 4 star campsite located in Nevez in the Brittany region of France. Les Deux Fontaines is a brilliant 4 star campsite that’s perfect for those families looking for an action packed campsite where they can enjoy and explore outside life. A short distance from the campsite lies the south Brittany coastline. Here you can find a multitude of fine sandy beaches, coves, fishing villages and harbours waiting to be explored. Les Deux Fontaines is a modern and well laid out campsite and although it boasts a great range of facilities and activities to keep you busy, you’ll also find plenty of space where you can sit back, relax and unwind in the summer sun should you feel the need. The nearest beach is literally within walking distance. Just 1km away you’ll find the stunning Plage de Raguenes. Lots of sand and plenty of space to sit back and relax, swim or play in the sand will ensure that you and your family have a fantastic time. If you’re looking for a campsite with a great pool complex then you won’t be disappointed. The campsite boasts 4 outdoor pools, 1 indoor pool, several water slides, a whirlpool and even a spa. Don’t forget that there’s also lots of sun terraces where you can sit back and relax in the sun! 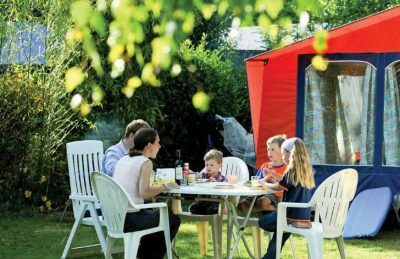 Les Deux Fontaines campsite offers a comprehensive selection of activities and facilities on site and also nearby to ensure you have a fantastic family holiday. On-site activities at the campsite include tennis, boules, football, table tennis, skate park, archery, pony rides, scuba diving, volleyball and a gym. Facilities available at the campsite include WIFI, restaurant, snack bar, takeaway, bar, groceries, games room, animation team, washers and dryers. Accommodation at the campsite includes a range of 2 and 3 bedroom mobile homes and tents that are available from Suncamp and Brittany Ferries. Click the button below to book your camping holiday in France with our travel partner, Brittany Ferries.